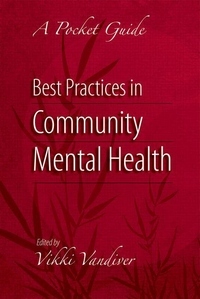 Best Practices in Community Mental Health: A Pocket Guide is a quick reference guide to best practices that are essential for providing comprehensive, holistic care. Intended for use across a wide range of disciplines within mental health-social work, counseling, psychiatric nursing and rehabilitation, public psychiatry-the pocket guide offers a well-rounded foundation of services that can be adapted to each practice setting. This comprehensive but compact overview lends itself well to in-service trainings and makes an ideal companion for students in mental health internships and practicums. The accessible, actionable format spares busy professionals the need to hunt through long textbooks and articles for the information they need right away. This pocket guide is the first book of its kind to compile such a diverse set of practices, providing essential theory and background for each one, along with a review of available evidence, steps for implementation, and strategies for assessment and evaluation. Each chapter opens with a case study that provides an insider's perspective and closes with a glossary and links to online resources.